The painting of the Empress Dowager, before, during, and after conservation. David Hogge is head of Archives at the Freer|Sackler. In 2011, the Sackler acquired a life-size portrait of China’s Empress Dowager Cixi (1835–1908) painted by Katharine Augusta Carl in 1904. That year, the painting was one of the Chinese government’s entries at the St. Louis Exposition. Then, it was given to President Roosevelt, who had it added to the Smithsonian’s collections. The painting was shown in the Smithsonian’s Art and Industries Building before being loaned to a museum in Taiwan in the 1960s, where it remained for more than forty years. Though it was halfway around the world, the painting presented a perfect companion to the original Empress Dowager photographs in the Freer|Sackler Archives that were featured in the exhibition Power|Play: China’s Empress Dowager. I suggested that we should have the painting returned to the Smithsonian and continue to tell the tale of international diplomacy through portraiture. Bringing it back was a big risk: we learned that it was badly deteriorated, and the elaborately carved, half-ton frame was in equally poor shape. Nevertheless, the painting was shipped to Washington, DC, and sent to our storage facility in Suitland, Maryland. When we unwrapped the painting, our worst fears were realized: the canvas was in dreadful condition with tears, cracks, peeling, and layers of grime and discolored varnish. 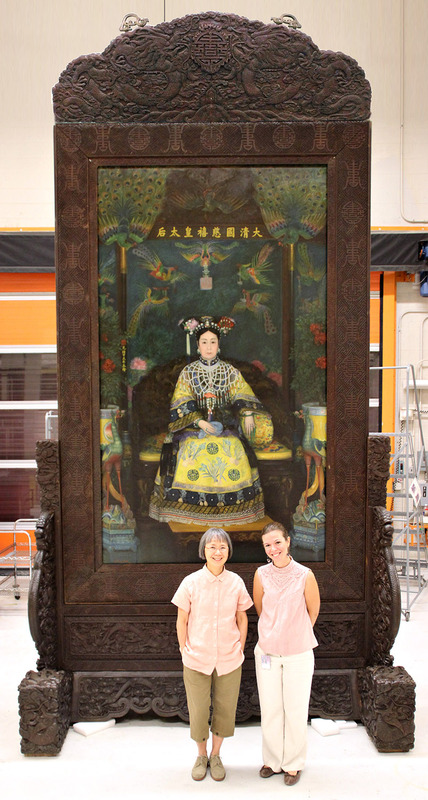 The restored painting of the Empress Dowager, with MCI conservators Jia-sun Tsang and Inês Madruga. Since hiring an outside conservator would have been prohibitively expensive, at the time I assumed that we would have to box up the painting and put it away for good. Fortunately, Suitland is also the location of the Smithsonian’s Museum Conservation Institute (MCI). Senior Painting Conservator Jia-sun Tsang was brought in to evaluate the painting. Rather than walk away in despair, she immediately saw the painting’s potential as well as its historical importance. Miraculously, Jia-sun requested and was granted the time and resources necessary to rescue the painting. While she and conservation fellow Inês Madruga oversaw a raft of analyses and treatments, Senior Furniture Conservator Donald Williams managed the repair of the frame. Overall, some twenty-three conservators, interns, art handlers, technicians, and contractors quietly labored away to restore the empress’s portrait. Last month, the painting and its frame were united once more. Thanks to these heroic efforts, in time, we hope to share this historic artifact with the public. View a slideshow of the conservation process. Learn more about this and other images of the Empress Dowager and their role in rehabilitating her international reputation. Next Post Next Post: Why is the Smithsonian Covered in Yarn? !